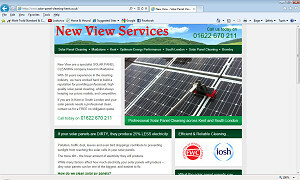 New View Services, a window cleaning company from Maidstone in Kent are now offering a solar panel cleaning service across Kent and South London. Research has show that dirty solar panels can be up to 25% less effective than those that undergo regular cleaning. Solar panel cleaning will actually save you money. With 30 years experience in the cleaning industry, they can provide professional, high quality solar panel cleaning at competitive prices. So whether you are in Bromley, Croydon, Sevenoaks, Ashford or Canterbury, contact New View Services for a FREE no obligation quote for your solar panel cleaning.